Bright [Wedding] on a Budget: D.I.Y. 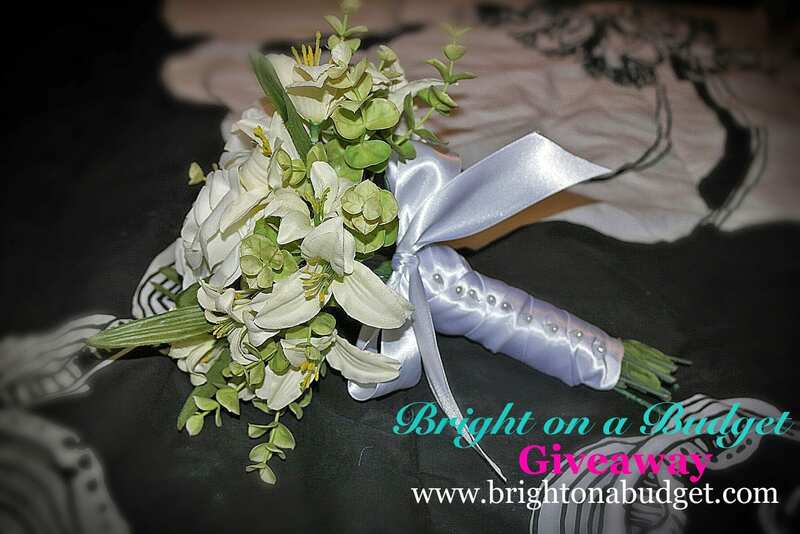 Bridal Bouquet for Less than $20 + a Giveaway! Weddings are expensive. Regardless of your budget, whether big or small, you’re probably going to spend that and then some. It’s so important to sit down before you start planning your wedding and set a budget not only for the entire wedding, but for each individual category–dress, photographer, venue, flowers, etc. As you start to look at different things, you’ll realize that your budget probably isn’t realistic. There’s a lot of sticker shock when it comes to weddings, and I’ve found that flowers is one area where people never budget enough money for what they want, or what they want just doesn’t fit into their budget. 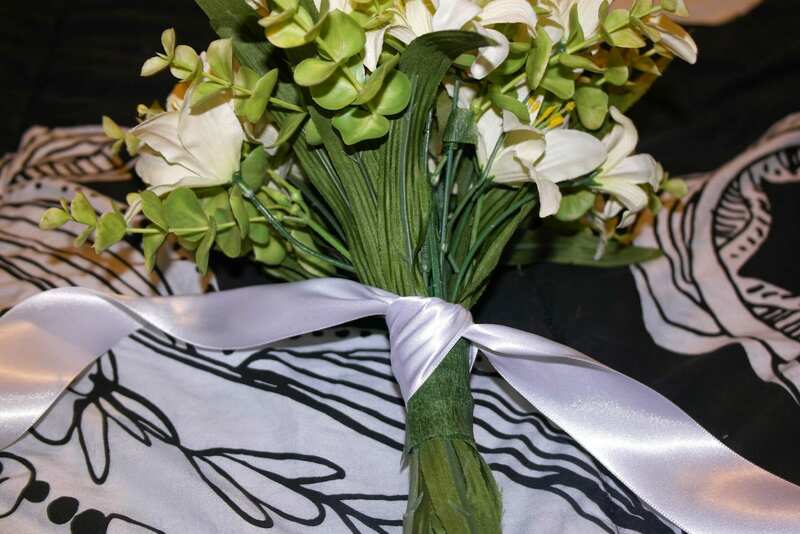 Bridal bouquets can run into hundreds of dollars, but with what I’m about to show you, you can keep the cost to $20 or less for the bridal bouquet and boutonniere! This tutorial can be done with either real or silk flowers. Silk flowers are much easier to work with, much cheaper, and hold up better if you’re having an outdoor wedding in the heat. If you do use real flowers, make sure to hydrate the flowers according to the florist’s recommendations. Scroll to the bottom of the post for the giveaway! Materials: flowers, floral tape, corsage pins, wire cutters, ribbon, scissors (not pictured). All of these items (excluding wire cutters and scissors) were purchased for less than $20 at Hobby Lobby! Make sure you go when their floral stems/bunches are 50% off! You can also usually catch certain categories of items, like ribbon, for 50% off, and they almost always have a coupon available for 40% off one regularly-priced item (find it here). Optional (not pictured)— paper towels, keepsakes to include. Step 1: Choose your flowers. I like to use 2 sizes of flowers plus some greenery that pokes out. Sometimes you will need to choose 1 flower that is open (like a blooming rose) and 1 flower that is closed (like a rosebud) depending on how the flowers look together. Save some leftovers for the corsage. While I have used neutral colors here, since this is a giveaway and I don’t know what the wedding colors will be, I like to use the wedding colors for the flowers and use white/ivory accents with the ribbon. Note: Green is a neutral color when it comes to florals, so you can always pick up a soft green flower if you need some extra/different color. 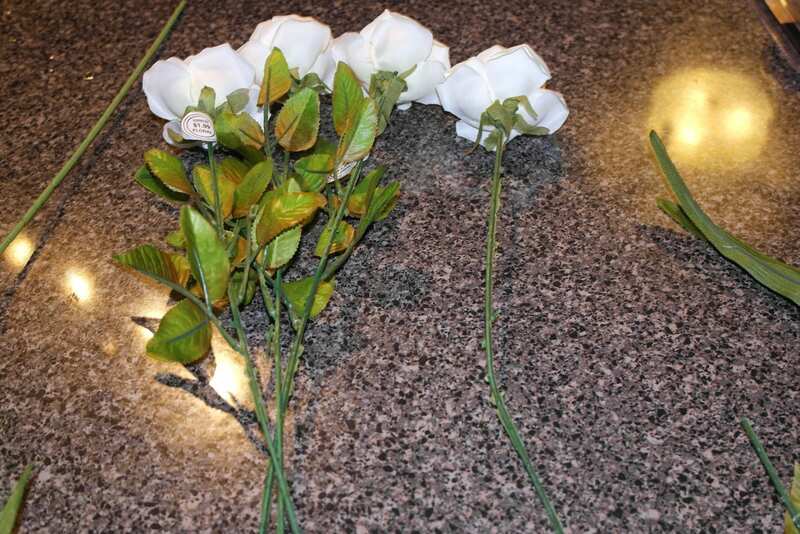 Step 2: Cut all of the flowers off of the bush (if attached) and trim all of the stems to the desired length. You should also either push up any greenery (leaves) if you have a flower like roses, or clip the greenery off. I like to clip the greenery and work it in later as necessary. Step 2: Arrange the flowers. You should add in any greenery that you clipped before that you want to include. If you don’t want to include the greenery, then toss it! Start by holding the flowers loosely in your hand and then placing them the way you like. 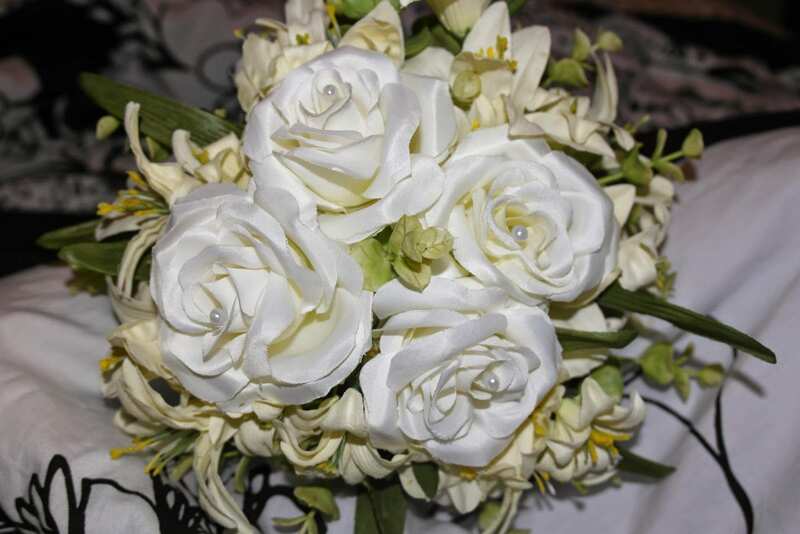 Note on size of bouquet: the bouquet should be small enough to show off the bride’s waist in her dress! 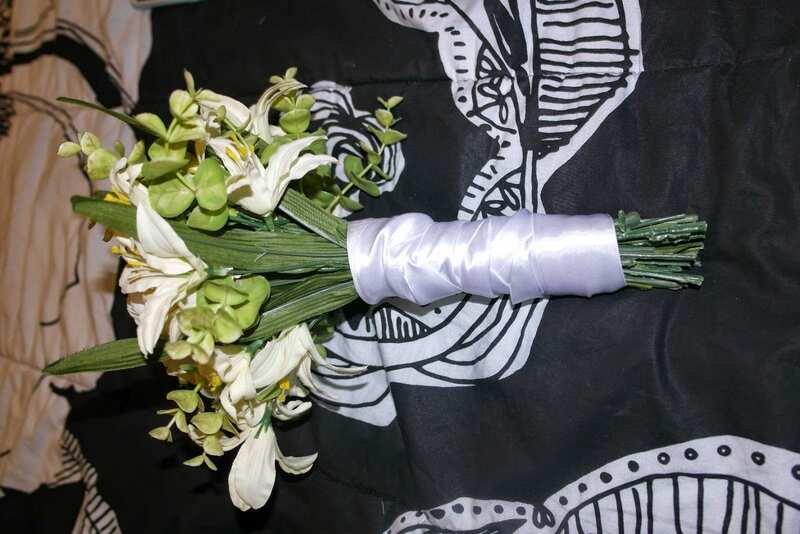 Step 3(a): Wrap floral tape around the stem. 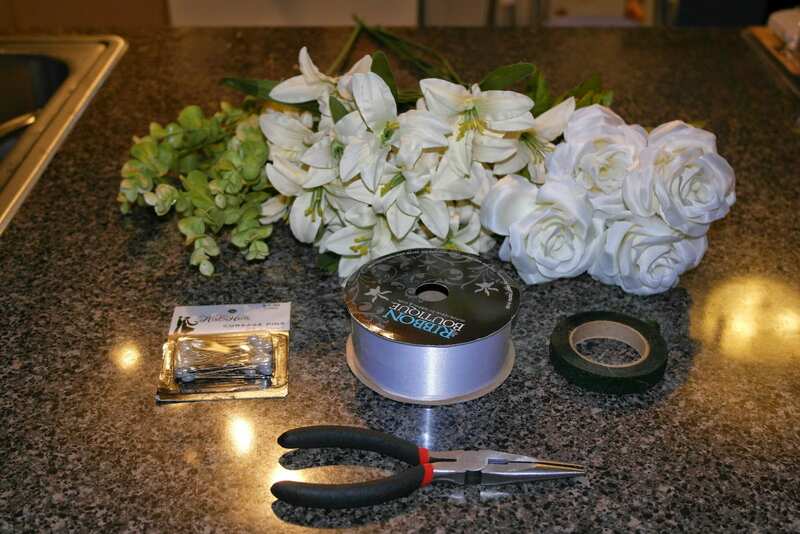 For this step, start wrapping the tape towards the top of the stems/bottom of the flowers. The trick to floral tape is to stretch it as you go, because that’s what makes it sticky! Just don’t stretch too much or you’ll break the tape and have to start over. If you do not want any green stems showing at the bottom of your ribbon, wrap the ends as well! Step 3(b): Optional. 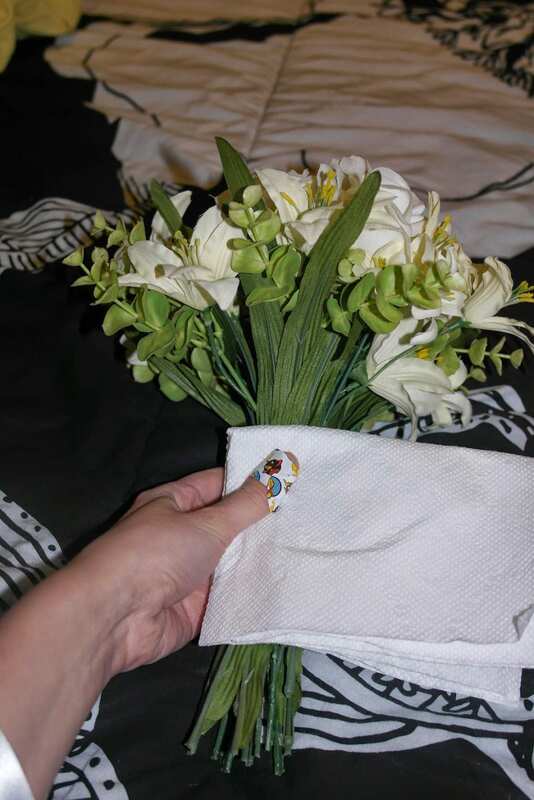 If you want the stem/handle of the bouquet to be soft or thicker than just the flower stems, then wrap paper towels around the stem for padding. Seriously cheap and easy! Please excuse my Angry Birds bandaid. I had a bad hangnail. UGH. Step 5: Wrap ribbon around the stem. 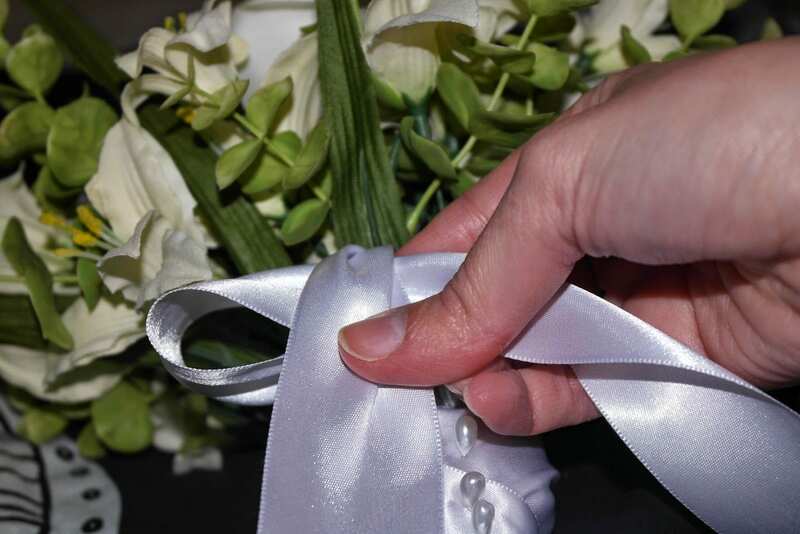 Start by tying the ribbon in a knot at the top of the stems/bottom of the flowers. This will keep your ribbon in place. Wrap the ribbon over the knot to cover it, and then wrap the ribbon down the stem. 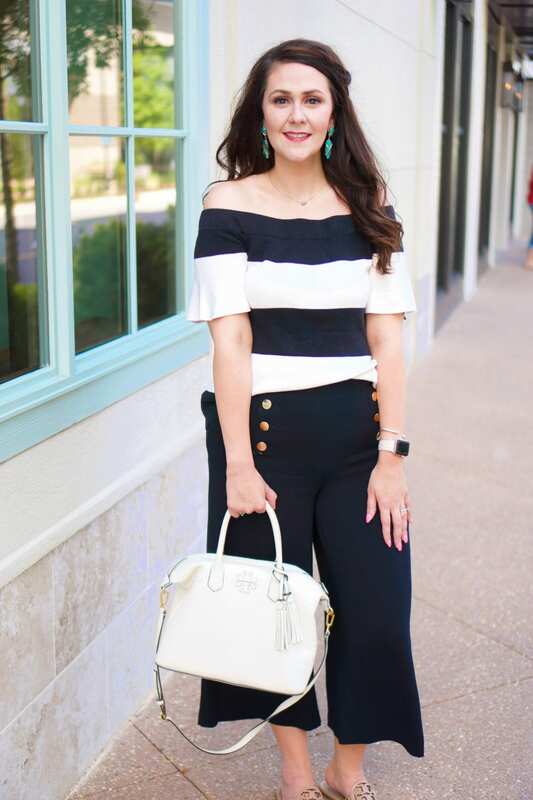 I like to use a criss-cross pattern. Here, I used a wider ribbon (1″, I think) to get a more “bunched” look going. Tuck the ends of the ribbon in when you have finished wrapping. You can continue on and completely cover the stems but I like to leave a little green sticking out. I started to not use the paper towel trick but then changed my mind. Here’s how you want to tie the knot, regardless of whether using paper towels. If you’re using paper towels, wrap the paper towels and then tie the know over the paper towels. Step 6: Add decorations. I grabbed some corsage pins and stuck them at a slant into the stem of the bouquet. This picks up the bridal button detail on many wedding dresses. 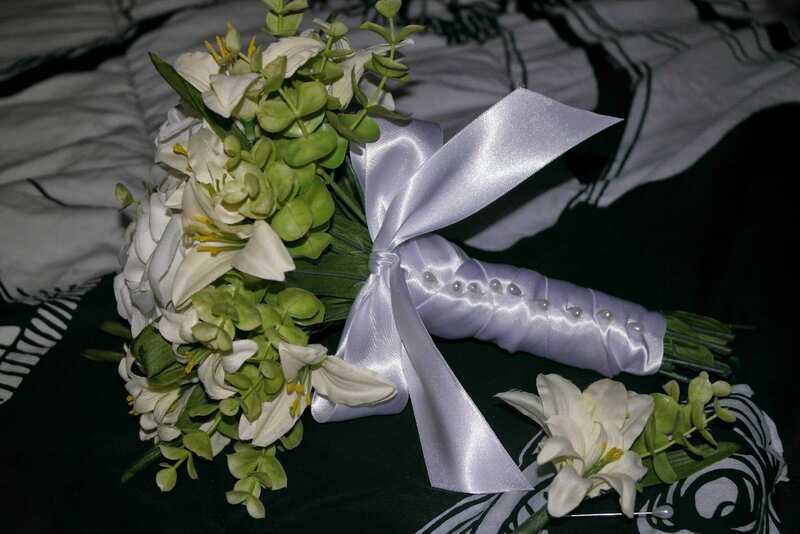 I tied on a bow to finish off the bouquet. The trick to tying the bow and getting it to look right is to tie the bow under-handed (see below), for lack of a better term. Go down and under to pull the loop up. I also took some corsage pins and stuck them in the flowers to add a little something extra. This would also be the time to add any keepsakes. I dangled the wedding rings of my mamaw, mom, and aunt from the middle of my bow by using a tiny sheer ribbon. You could also attach a locket or other small keepsake the same way! Once your wedding is over, you can always lay your bouquet on an accent table or place it in a hutch to display it! 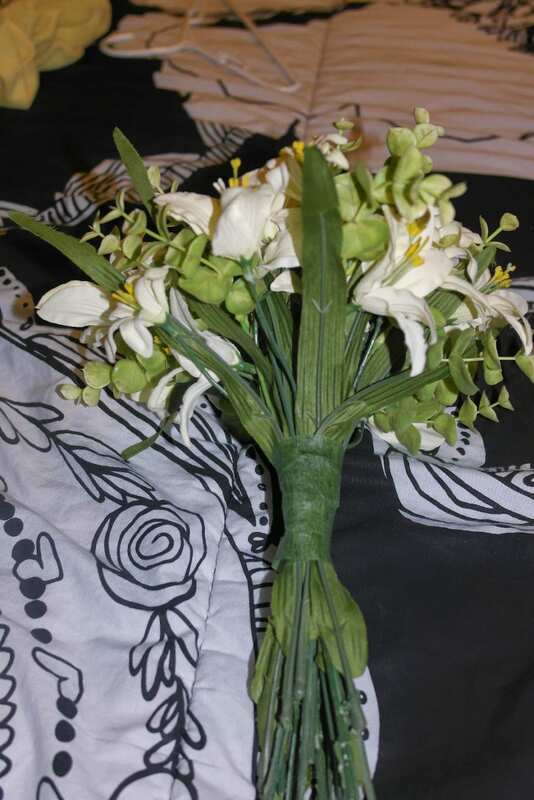 So, since I’m not in the market for a bridal bouquet, but I had to make one to show you all this tutorial, I am giving away this bouquet, plus a matching boutonniere (not pictured)! Enter below, and be sure to share with all of your friends who are getting married! Tune back in on Friday, where, as part of my H54F post, I’ll show you how to whip together a matching boutonniere! Love this! So excited to start working on my wedding flowers! !